Phyteuma is a sort of perennial two-submultiple plants belonging to the family of Campanulaceae. 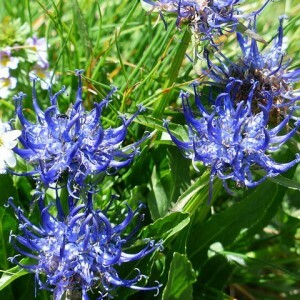 In a wild form Phyteuma lives in the woods, mountains and on meadows in the European and Mediterranean countries with a temperate climate. The scientific name Phyteuma has the Greek origin: the word "φυτεύω\" means "to put". Germans very poetically treated this plant and highly appreciated its edibility and a unique form therefore in Germany there are also informal names of Phyteuma which are translated as "a dairy/oil root", "divine fingers". Phyteuma. Phyteuma variety. Phyteuma cultivation.